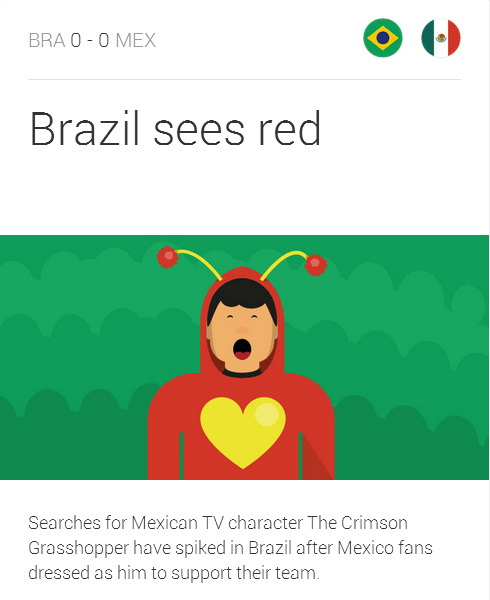 With global attention and excitement around The FIFA World Cup, Google is leveraging real-time search data to curate sharable facts and visuals to help fuel online conversations around the matches. Created in partnership with R/GA London, this marks the company’s first-ever newsroom based on Google Trends search results. According to Fast Company, a team of 20 from Google Trends and R/GA London will work out of a dedicated World Cup Newsroom in the company’s San Francisco office. The team has been tasked with analyzing real-time search trends before, during and after each match, with the goal of identifying compelling, sharable trends to supplement online conversations around the World Cup. Once identified, each trend is then paired with a complimentary visual. Under each visual, users have the option of sharing the content across Facebook, Twitter, and Google+. Users can also click on the visual to see detailed search trends from each match. Trends include everything from sentiment, to which team was searched the most, top questions around the match, and which players generated the most interest. In each section, information icons offer users more background on how the data was complied. The site will be updated in real-time as matches occur and generate new trends to share. 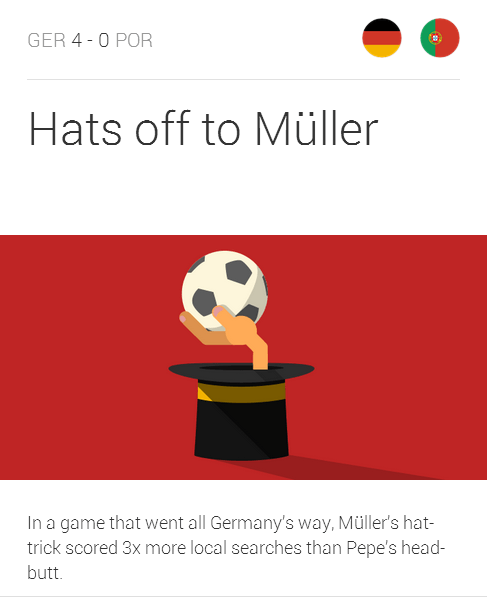 What can we learn from Google’s World Cup Newsroom? 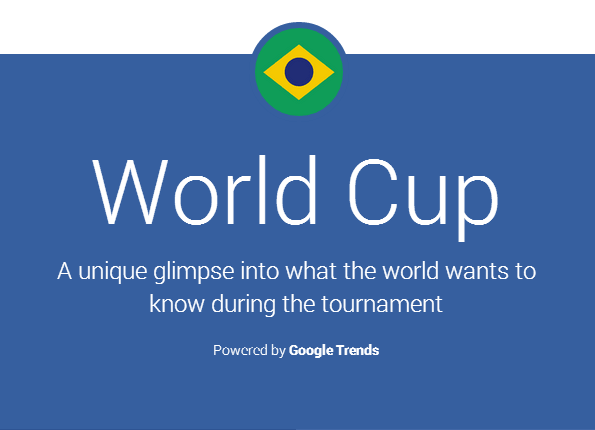 With data from Crowdtap predicting that 74.2% of viewers will be on social media during the World Cup matches, this initiative from Google offers a strategic opportunity to enter the conversation in a way that adds value to the viewing experience. The key with real-time activations of this nature is to understand your target audience and what motivates them to share, engage, and spread your content in the moment. As seen with Google, the trends are derived by data and packaged into snackable facts, making the content easy to share and add to the social media water cooler conversation around the event. Pairing visuals with the trends was strategic, as the combination will generate a higher level of engagement and inspire more social media sharing. As noted in my book, The Power of Visual Storytelling, humans process visuals 60,000 times faster than text alone. 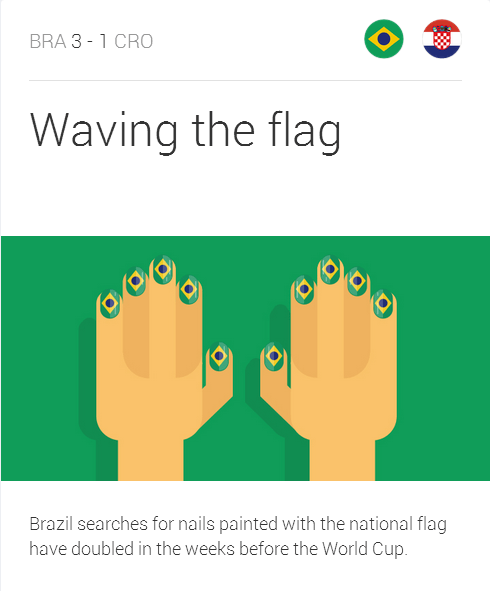 Google’s eye-catching visuals compliment the trends featured, translating them into an easy to understand story. The visuals also make it easy for people to find information on a specific match or team quickly. Once shared across social media, the World Cup trend visuals will also spark more engagement than if they were text-only. It’s worth noting that some of the trends are unexpected and others humorous, offering an element of entertainment to the initiative. People seem to be more open about what they search for on Google vs. other social media channels, offering insight into the interest around more entertaining conversation topics. Mixing in a range of trends will offer Google a unique opportunity to test different types of content and measure the trends that resonate the most. 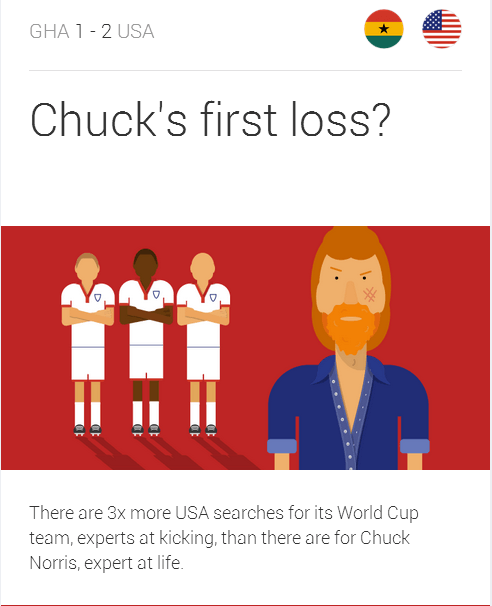 With matches and pivotal moments coming fast and furiously around the World Cup, the Google team clearly understands that relevancy has a deadline. Successful real-time marketing takes the right tools, analytics, and the correct process structure to maximize the activation. As seen with Google’s 20-person World Cup Newsroom, it’s clear that companies need to plan for what they can, but set up an infrastructure that welcomes being nimble in the moment. For example, having the right people involved and aligned will help to streamline processes to be prepared and poised to take hold of big opportunities and make them your own. 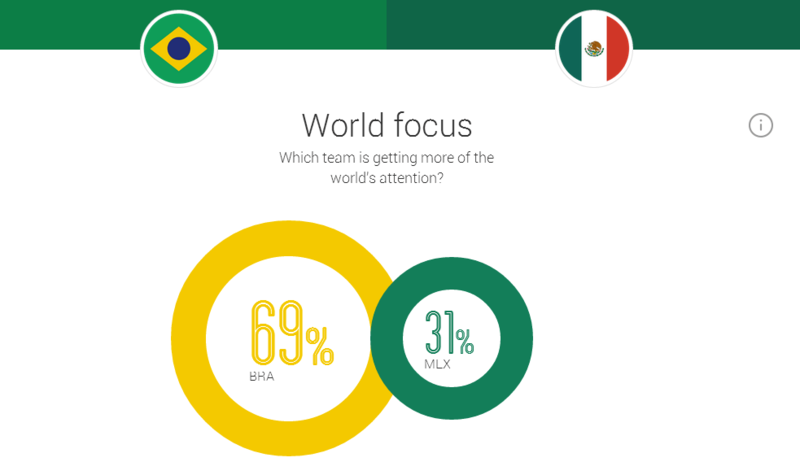 To follow along with Google’s World Cup trends, visit the dedicated page here.